Check Family Fare Weekly Ad Circular, valid April 21 – April 27, 2019. This Week Ad best deals, and grocery savings on: Whole Seedless Watermelon; Blueberries; Spartan Fresh Selections Deli Salads Potato, Macaroni or Cole Slaw; Breyers Ice Cream; Aunt Millie’s Homestyle Bread; Daisy Cottage Cheese or Sour Cream; Spartan Adult Cereal; Spartan Rising or Thin Crust Pizza; Heinz Tomato Ketchup; Spartan Fresh Selections Fresh, Natural Boneless Center Cut Pork Loin New York Chops; Spartan Fresh Selections Fresh, Natural Boneless Center Cut Half Pork Loin; Purex Liquid Laundry Detergent; Strawberries, Red Raspberries or Blackberries; Jumbo Sweet Cantaloupe; Marzetti Veggie Dip or Spartan Fresh Selections Baby Carrots; Sweet Baby Ray’s BBQ Sauce; John Morrell Sliced Bacon Applewood; Spartan Center Cut T-Bone Chops; Tender Ridge Angus Boneless Chuck Roast; Spartan Traditional Spiral Ham Dinner; Florida’s Natural Orange Juice; and more. 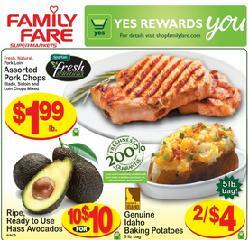 Find all deals, offers and great prices in the latest Family Fare Weekly Sale Ad Circular.